The Industrial Laser Series can grow with you now and in the future to meet your changing production needs. Being able to custom-configure your laser system is a ULS core philosophy. We believe you should purchase only those options you actually need. Should your needs change, you can easily expand the capabilities of your ILS laser system at any time with our optional accessories. For example, suppose you start out with an ILS9.150D equipped with a 30-watt laser. As your production needs increase, you can upgrade to a higher-power laser for faster throughput. Then when more demanding jobs start coming in, you can mount a second ULS laser for faster cutting and deeper engraving. You can convert your ILS from a light-duty to heavy-duty system in the field quickly and easily. 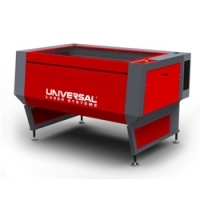 The Industrial Laser Series offers unmatched upgradeability.